Answer: Thank you for your interest in plan number 69764. The RV Garage door is 14’ tall and 12’ wide. The remaining three doors are all 10’ tall and 10’ wide. The garage portion has a top plate height of 16’. The recreation room has a top plate of 9’ and the storage above is at 5’11” with the vault measuring about 9’10” tall. Please let us know if you have any other questions. We look forward to helping you with your design needs. Question: what is the size of drawing sheets? 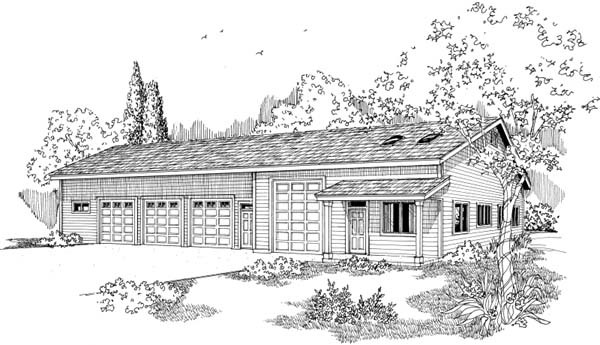 Do plans include: floor plan, foundation plan, framing plan, cross section, elevations? This garage plan is plotted on 24” x 36” pages. Our construction drawings will provide you with the elevations, floor plan(s), floor framing plan, roof framing plan, foundation, sections, electrical layout and supporting details. Question: Could you give me the height of the RV garage door and the depth to the space before you reach the utilties along the wall. What length and height of RV could it accommodate? Thanks. Answer: Thank you for your interest in plan number 69764. The RV garage door has a width of 12’ and is 14’ tall. The depth of the RV portion of the garage to the utilities is about 32’10”. 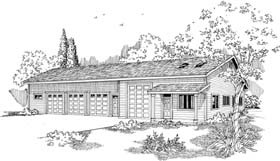 As the garage is currently drawn any RV that is less than 14’ tall and 47’ deep could fit in the space provided. We can certainly modify the construction drawings if this will not accommodate the RV you are trying to store. Please let us know if you have any other questions. We are happy to help.